A cruise ship, A treaty made with ancient vampires and human sacrifice. 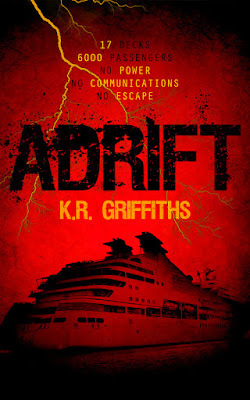 Adrift follows a newly married couple Dan and Elaine on their honeymoon vacation on board the Oceanus a floating paradise. Dan who suffers from panic attacks and agoraphobia is already feeling massively out of his comfort zone being on board the ship. Once out at sea, Dan see's something from the balcony of his suit, a body being thrown overboard. Heading off to find security to report what he's seen Dan doesn't realise what he's about to be dragged into. When an EMF bomb goes off and disables everything electric including the ship itself. Everyone starts to panic, Then a helicopter drops a large container on the ship. This is when the trouble really starts. I gave this book 4-Stars. I did enjoy but I'm glad I got it for free on kindle unlimited as I found it a bit of a slow starter and it didn't really get me going towards the end. I liked how the vampires weren't your typical vampire that you get these days, I did enjoy how they were different. The way I pictured them in my head is very different to how they are portrayed in many other books/films and shows these days. I found I liked Dan as a character I could relate to him as I suffer from the same anxiety issues as he does, for other reasons but still. I do like a character I can relate to. I also liked how the brothers redeemed themselves in the end. I will be reading book two but again I can get it free with Kindle Unlimited so I don't think I shall be purchasing it.